Hey guys, how are you doing? 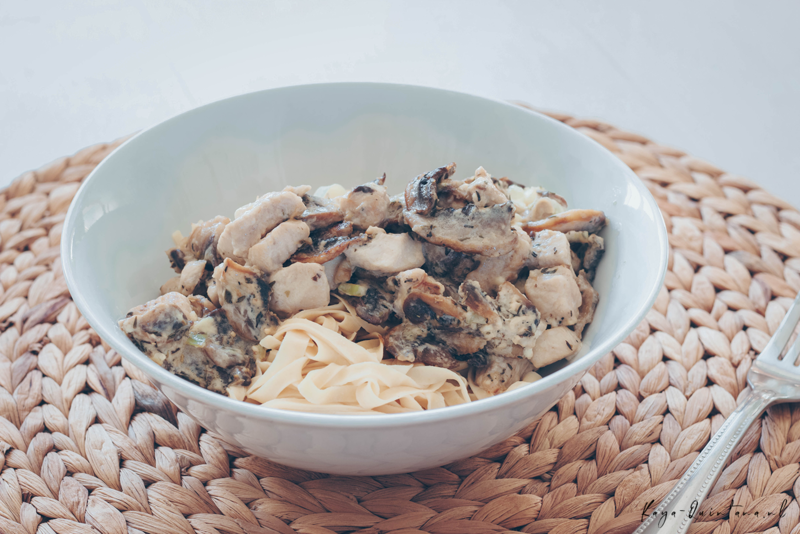 Are you ready for low carb pasta with chicken? I know I am, so I’m sharing the recipe today. You see, eating healthy and Keto style hasn’t been easy the last few months. I’ve been traveling a lot and being stressed has taken its toll. I’ve been snacking way too much and too often. I figured that cooking some tasty dishes would kick me back into the right gear. And I have to say it really does, so let’s get to it! Remember my article about the Risenta lasagna sheets? Well, turns out they also sell low carb pasta made of yellow soybeans. You might have already seen them in my latest ‘What I eat in a day’ video. 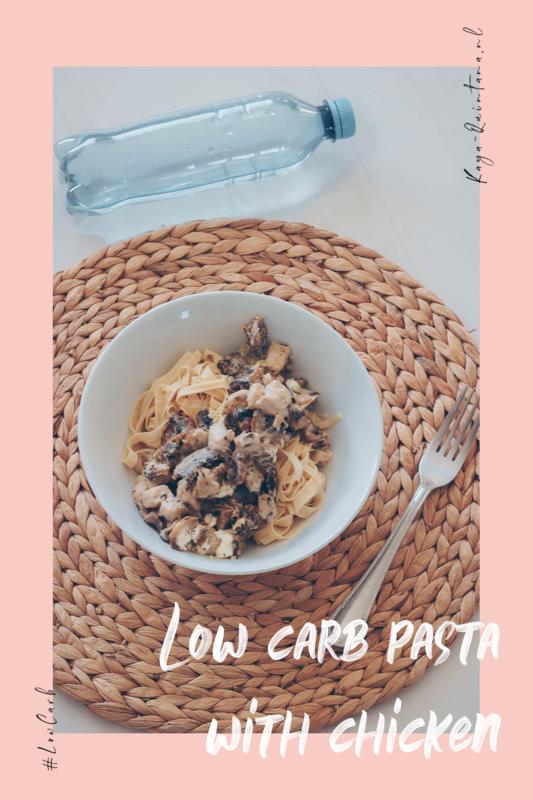 This low carb pasta has been a live saver for me. Mainly because it comes really, really close to real pasta. Something I rarely eat because it’s not Keto, but it also makes my stomach hurt a lot. That’s why I’m extra thrilled with this low carb option. Grab a pan, fill it with water and heat it up until it boils. Start with slicing and dicing the chicken breast. Make sure you don’t forget the mushrooms as they should hit the pan first. They take the longest to cook and I like them golden-brown. Start by cooking the mushrooms and the spring onion in your pan. I love spring onions because they give a bit of a kick to your dishes, without being to in your face. Or should I say taste, haha! You could also use an onion or maybe a leek if you like an extra kick. Glaze the mushrooms and spring onion before you add the chicken breast. I like seasoning as I go, and I start with pepper and salt when the chicken is in the pan. I then added the dill and thyme for a Mediterranean flavor. I personally really like spicy food, but you can make it as spicy as you like. Just make sure the herbs get the time to really bake to get the flavor out. This is why recommend not using too much olive oil. Because your pasta sauce might get too watery in combination with the moisture coming from the mushrooms. Make sure your chicken is full cooked before you add the crème fraiche. No one likes raw chicken, blegh! Stir in the crème fraiche for a nice and creamy sauce. 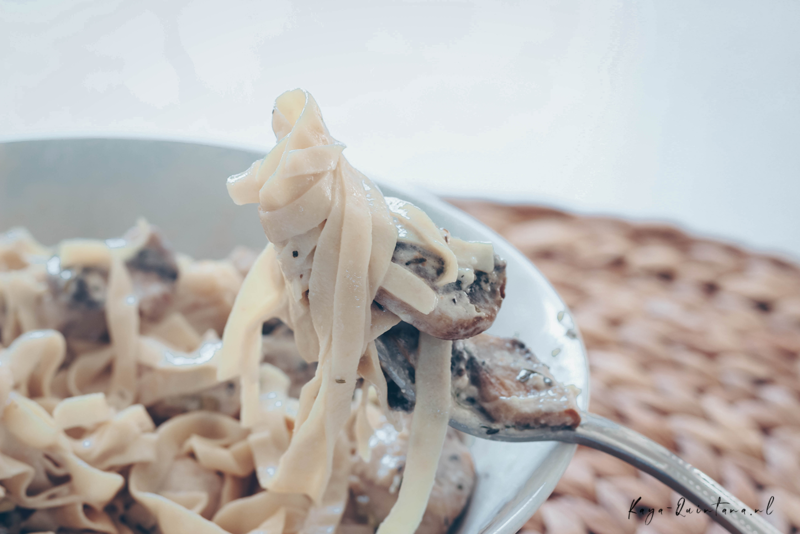 Let it simmer on low heat and start cooking your low carb pasta. It only takes 3 to 5 minutes to cook, so you should be done just in time for the sauce to finish. 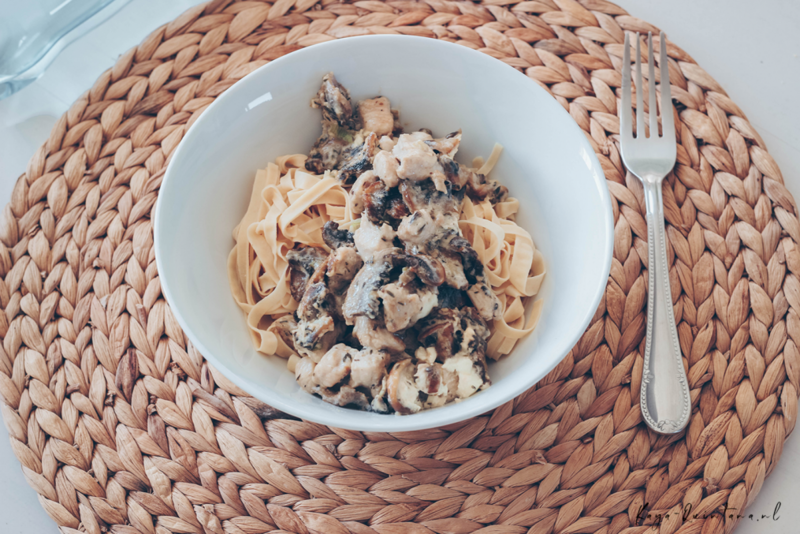 Now it’s time to plate it up by draining the low carb pasta and putting in on your plate or a bowl. Add the sauce on top and finish it with some grated cheese. I used cheddar this time, but you can use any cheese you like. 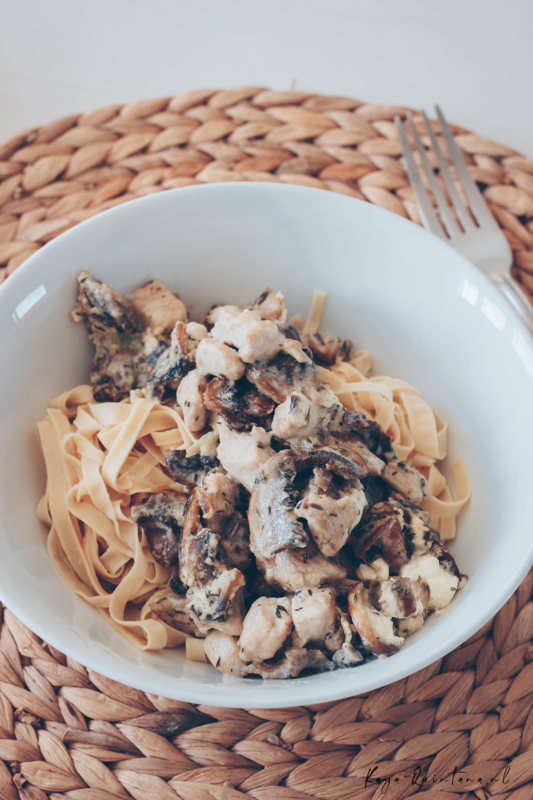 There you go, you now have a low carb pasta with chicken in front of you. 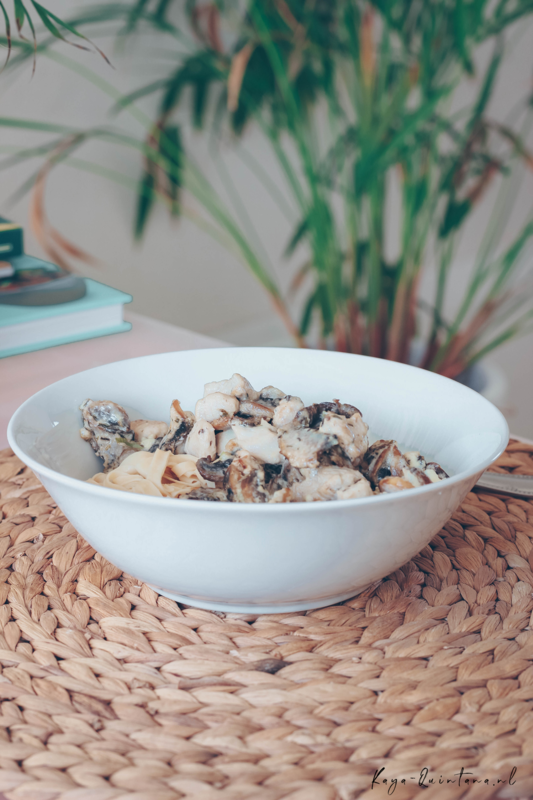 A bowl of low carb pasta with chicken will be around 553 calories. It will contain about 9 grams of carbs, 31 grams of fat and 57 grams of protein. I have to be honest and say this dish was pretty filling. 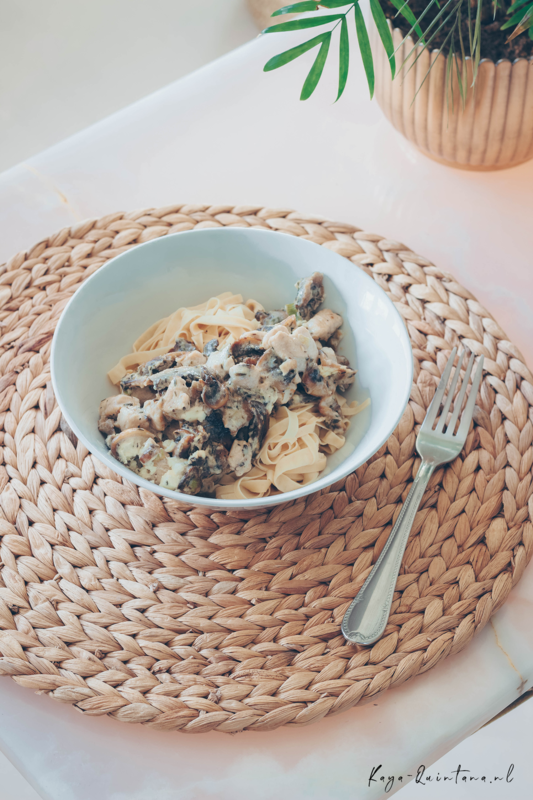 It actually took me a while to finish it, so you won’t go hungry after eating this low carb pasta. It’s also quite tasty, so give it a try! Let me know if you like it and enjoy your pasta! P.S. 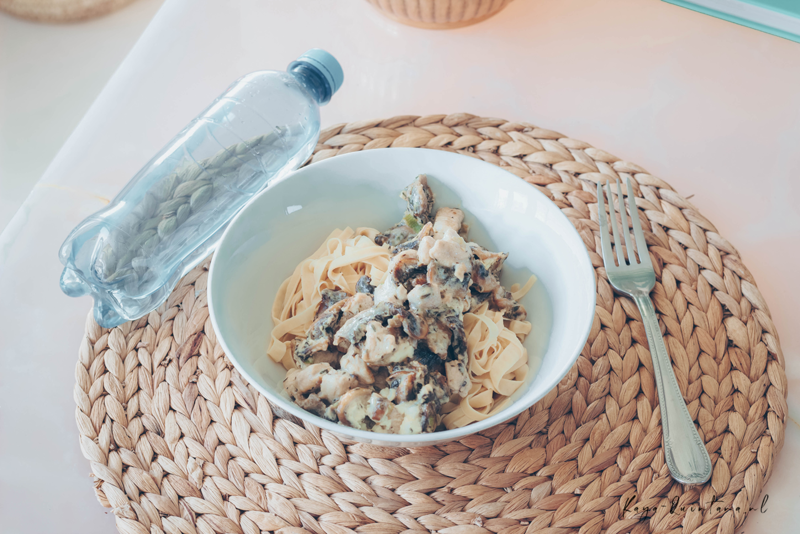 Follow me on Bloglovin for more low carb recipe ideas.